According to Chinese legend, there is a myth that the gods tie an invisible red cord around the ankles of those who are destined to meet and marry – this red thread of fate symbolises the fated connection that two people share. I discovered this alternative myth during my days of teaching, but rediscovered it this week, rather randomly, whilst looking at the Chinese zodiac ahead of the Chinese new year. It was perfectly timed. With so much of my time and energy invested in planning our wedding, I’d somehow, slowly lost hold of the tangible thread of our memories, the over-whelming romance, but never of the total belief that our re-connection six years after we first met was, in fact, fated. Whilst driving home in the darkness from yet another day at the office, I’d neglected to turn on the radio and with only myself for company, I instantly became immersed with my thoughts. Usually I’d be thinking about the events of the working day, or what tasks needed to be completed in the house on my return, but not on this evening. I was so preoccupied, that I’d omitted to register the silence, nor the monotony of the routine drive because on that night, I was thinking about the red thread of fate, our story and ultimately, the husband John will be. I’ve never attempted to pen our story, whether on paper or on the blog. I always worried that I’d somehow lose the spark of the memory, or it wouldn’t be quite as special as I envisaged, or even worse, corny! With six months until our wedding and of course, it being Valentine’s Day, what could be better timing for a love story? To celebrate love stories, like mine, at the bottom of this post you’ll find a romantic giveaway in collaboration with Thomas Sabo at Very! It all began with a chance meeting in a university library, back in the spring of 2006. I was completing the final year of my undergraduate degree in Journalism with my core degree modules to study for, as well as my qualifications for the National Council of the Training of Journalists. And then, I met John. I wasn’t looking for love. I wasn’t even looking for a boyfriend (not that he ended up being my boyfriend, that year) – but on the same day, there we were in the local student boozer enjoying a drink in a sunshine-flooded beer garden. It was such a serious time in my life with key decisions to make: where would I live when I completed my degree? What career would I pursue knowing I didn’t want to work in an agency, nor for a local newspaper? John made me laugh and without knowing, he took a weight off my shoulder and helped me to escape the pressures of impending graduation. I never thought of him as my boyfriend, but I knew he was special. Life was fun, bright and exciting when he was around and no-one had made me feel this way before. We dated: romantic meals, evenings at the pub, you know, but as the embers of summers slowly fizzled out and with the burden of responsibility looming, John went his way and I returned home. He was never my boyfriend, but it felt like a break-up. I sat on the train back home, earphones in, deafening myself with the noise of the Deftones and biting my lip to stop the tears from coming – all the while, chastising myself for not being the strong independent woman I thought I was. I rebuffed all future text messages from him, and that was that. Later that year, I met someone else. He wanted to train to be a teacher, as did I. He wanted to travel, as did I. He was into the same music – we had a lot in common and for a short while, things were good. Life was never as exciting, or as fun, but I felt like I’d found a safe bet. We both qualified as primary school teachers in 2009, bought a house. We had it all, or so others thought. As the years passed by, there was little excitement to be found in life. There were no celebrations, we didn’t even raise a glass of fizz when we moved into our renovated home (after years of working on it) and so, I immersed myself in my teaching role. It worked. I was promoted to a literacy lead and a middle leader. With this came a pay-rise and training, I remember being so excited! I couldn’t wait to get home and tell everyone my news – especially my fellow teacher partner. Not that I had expected a celebration from him, but he couldn’t even say well done. It was time to end things, after six long years – I just couldn’t bear the thought of living my life this way. In our seven years apart, there was never any real, or meaningful contact between John and I. I think we had both got on with the fate we’d been dealt. But in this time, occasionally, my mind would drift to John who was working in America, or so Facebook told me. I never forgot about him but I never considered I’d ever see him again – until I started to dream about him. In all of those years, John must have been lurking in my subconscious. After I split from my ex, I started to think about John more, useless what ifs taunting my already fragile emotional state. As he’d effectively dumped me, so many years ago, I thought my mind was playing an evil trick – especially when the dreams started. On two consecutive nights, I dreamt of each of my married best friends, sat alongside their respective husbands, pointing to John. It’s true that once something is on your mind, you start to look for clues and I found them: in music, in magazines – I felt like the universe was screaming at me. But still, I refused to contact him. And then, he texted me. He texted me. Just like that. Facebook may have helped in this coercion, as I’d recently changed my status to single. And so, we started to casually chat to one another, just like old times, talking later and later into the night. The suggestion of meeting for a coffee was raised and rebuffed, then… he raised it again. my head was loudly telling my heart that I didn’t love him, that it was absolutely ridiculous and to bloody well pipe down. Of course, I didn’t love him then as I do now, but it was like we’d never been apart and again, I knew he was special. I was smiling once more, and that wondrous carefree feeling had returned. 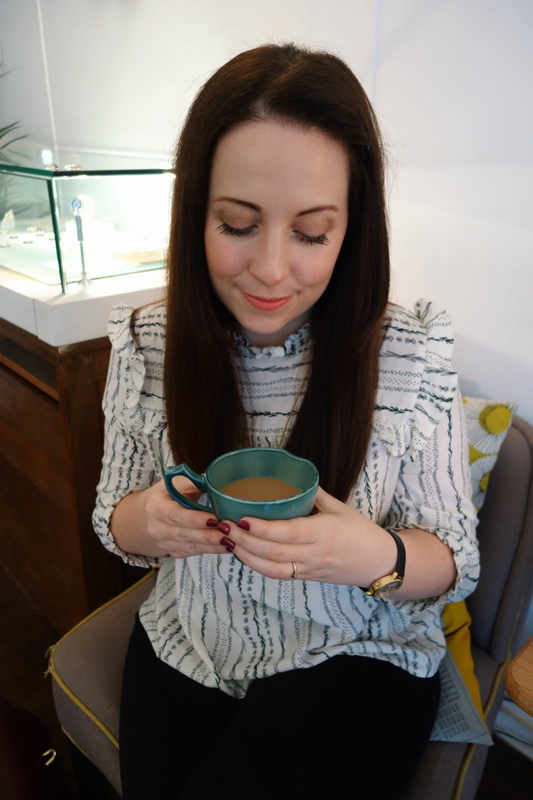 Our quick coffee date turned into a stroll in the Northern Quarter, following paths with no final destination in mind, which turned into a plan to see each other again – for our first date! The rest, as they say, is history. Fast forward five years, our relationship has inevitably changed as we live together and learn more about each other, it’s so easy to lose sight of the wonderful things, the romance at the start of a relationship as you navigate through adulting: mortgages, car insurance, home insurance, taking out the bins, keeping on top of the washing and urgh, whose turn is it to cook tea again? But peppered amongst the mundane daily chores of life are those warm, enveloping hugs, that listening ear at the end of a frustrating day at work and of course, the fundamental qualities of why I love John dearly: patience and kindness. In the spirit of celebrating love stories like mine and to celebrate Thomas Sabo at Very, I’m pleased to be able to offer you the chance to win the featured Thomas Sabo ‘Together Forever’ necklace from the Thomas Sabo collection at Very – worth £99! One randomly selected winner will receive their very own ‘Together Forever’ Heart Linked necklace, to have and to hold. This competition closes at 11.59pm on the 21st February. Extra entries will also be accepted via specified social media posts. 1. Visit the ‘Together Forever’ collection by Thomas Sabo at Very, by simply clicking HERE. 2. Comment on this post with your favourite piece from the Together Forever collection in the blog comments below! 3. Ensure you leave an email address in the comments, this will only be used to contact the prize winner and by leaving your email you consent to me doing so.